As we face life, we can be overwhelmed by its giant obstacles, or be inspired by its giant opportunities. Challenges and uncertainty tend to corrode our confidence. It is in the face of the unknown that we can move forward by faith, or backward in disbelief. What giant obstacles are you facing? How can your obstacles be converted into opportunities? Obstacles are stepping stones for obedient feet to follow.Therefore, with aggressive patience, stay focused and you will eventually see some obstacles dissolve, and others transformed into treasures. Maybe a financial giant is looming large as an intimidating obstacle? If so, stay true to your integrity by not selectively suspending your core values for needed results. Instead, remain faithful to wise stewardship and honesty, and the right results will follow at the right time. Trust God to use scary giants for His glory.God orchestrates giant opportunities for His greater good. He told Moses that He was giving His children the promise land; all they had to do was show up and receive His gift. Giant opportunities do require faith, planning, perseverance and hard work, as the reward of obedience and trust in the Lord is enough. So how are you facing the giants in your life; as obstacles or opportunities? Leaders look and pray for opportunities, and then explore them with energy and enthusiasm. Your relentless leadership inspires your family, friends and work associates to remain faithful and to not freak out. Therefore, take the land of opportunity the Lord has given you. Difficult days and economic challenges are greater opportunities for God to get the glory. So be aggressive, increase your efforts, pound heaven in prayer and by faith receive what your Savior Jesus has already given you. Go after the giant opportunities with gusto and by God’s grace. The Bible says, “I can do all things through Him who strengthens me” (Philippians 4:13, NASB). 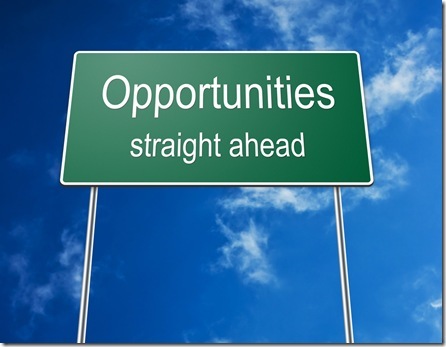 What giant obstacle do I have in which I can trust God to make an opportunity?